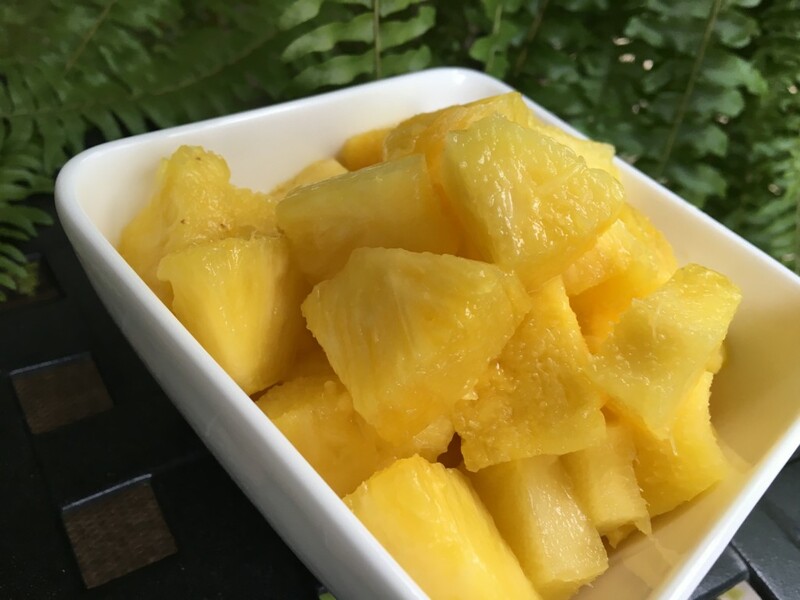 I love fresh pineapple all year long and fortunately we are able to purchase them all year long. I used to dread cutting the pineapple up and sometimes I would cheat and buy the already cut pineapple at Costco or Sams’ Club. But that was so expensive and sometimes the pineapple wasn’t completely ripe so I felt like it was a waste of money. Then I saw my friend Heather cut a pineapple with a really cook kitchen gadget so I bought one. Now I have fresh pineapple all the time and it only takes a few minutes! I can buy fresh pineapple at Costco for $2.99. That is a bargain! 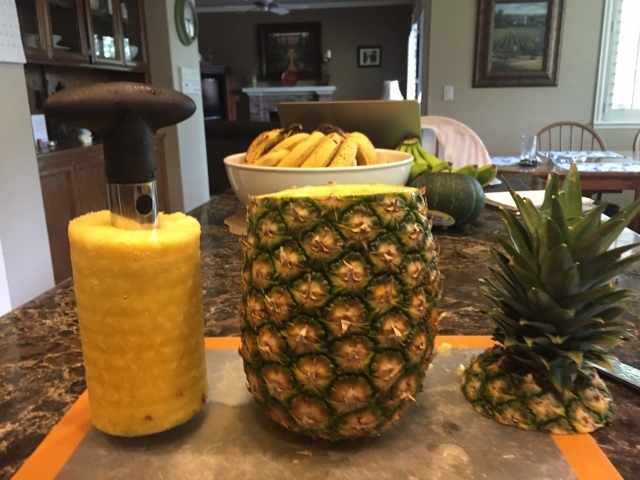 I saw my friend Heather Goodwin cut a pineapple with a gadget like this and I knew I had to have one too! 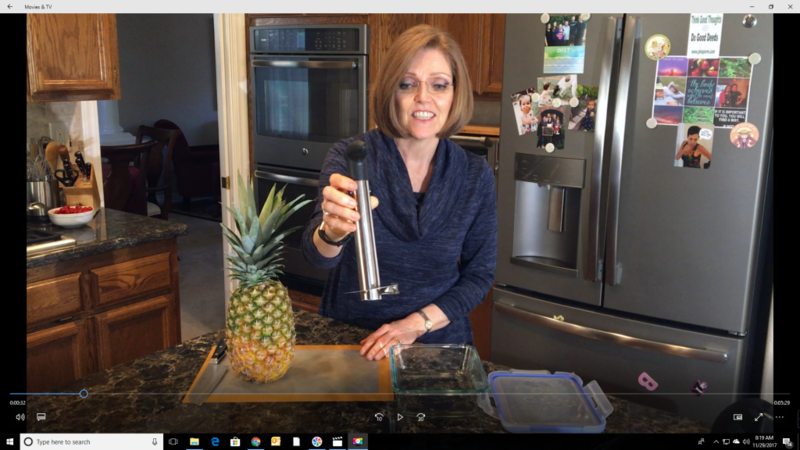 It is called a Stainless Steel Easy Pineapple Slicer and it cores and cuts the pineapple all at the same time. 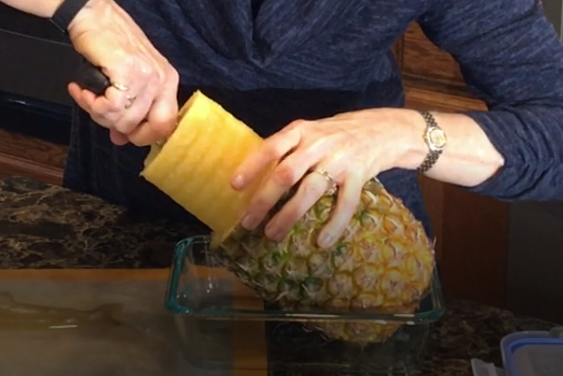 It is as simple as it looks, just cut the top of the pineapple off and insert the slicer. Start turning the handle until it stop. The pineapple gets cored and cut all at the same time and it pulls out so easily. You can have rings or you can cut it into chunks. Easy – peasy! Here is a short little video showing you exactly how this little gadget works. If you purchase items through my Amazon Associates links it helps to support the work here on Nutmeg Notebook and my You Tube channel with no extra cost to you! Thank you for your support. Tom and I are working on making more videos and if you have any suggestion for what you want to see please leave me a comment here on the blog and we will consider your requests! I am getting more comfortable being in front of the camera so it’s not as scary as it was! Thank you for all of your support on this endeavor – it’s good to keep learning, growing and moving outside of our comfort zone.